Today most mainstream medicines are made from chemical derivatives and even fossil fuels. They are, as a general rule, very new creations that often mimic or are derived from the active constituents of herbs. Herbal teas are usually taken for their flavor and/or ability to subtly alter the body's chemistry. Either way they are a strong tradition that continues today. Some people prefer to buy herbs in bulk rather then in tea bags because they can be used for making tea blends, salves, tinctures and so on. 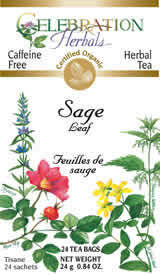 We offer herbs in tea bags and in bulk. You can tell the difference because the background of all our bulk boxes have a solid color and the teabagged items have a white background. An example of both boxes is shown below. The Wildcrafted (Pau D'Arco) box is bulk, while the Certified Organic (Sage Leaf) and Pure Quality (Cranberries) boxes are teabagged items. You can also see the difference between herb growing conditions by comparing the above packages. Why can't I smell the tea through the box? Great herbs deserve to be fresh. Another one of the reasons our tea is a hands-down winner is the freshness bag we use. Because scents can't travel through it like conventional poly bags, you can't smell through it. When scents are held in, so is the flavor and medicinal potency. Because it isn't cellophane it won't rip or tear easily. Our inner bag also has a zip-lock seal that ensures your tea will be fresh every time you want a cup. Is your tea environmentally friendly? Our boxes are made from recycled paper and can be recycled again to help conserve the environment. We use chlorine free tea bag material and you won't find strings or tags on our teabags. The herbs themselves can be composted. Herbal teas have been the choice of healers all over the world for centuries. Although modern medicine has entered the scene, the ancient wisdom possessed by apothecaries should not be forgotten. It is an asset to mankind. Celebration Herbals Teas are good for you and are of the utmost quality; they are environmentally friendly, have a special stay fresh bag and a huge selection. 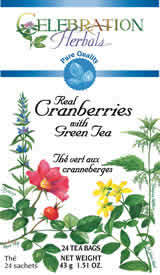 So with all these questions answered, the only one left to ask is: "Why wouldn't you enjoy Celebration Herbals teas?" We wish you a great cup of tea!